Closing Arguments Ahead In Trial Of Michael Jackson's Doctor : The Two-Way Prosecutors and defense attorneys in the involuntary manslaughter trial of Dr. Conrad Murray, the former personal physician of the late entertainer Michael Jackson, will deliver closing arguments Thursday. 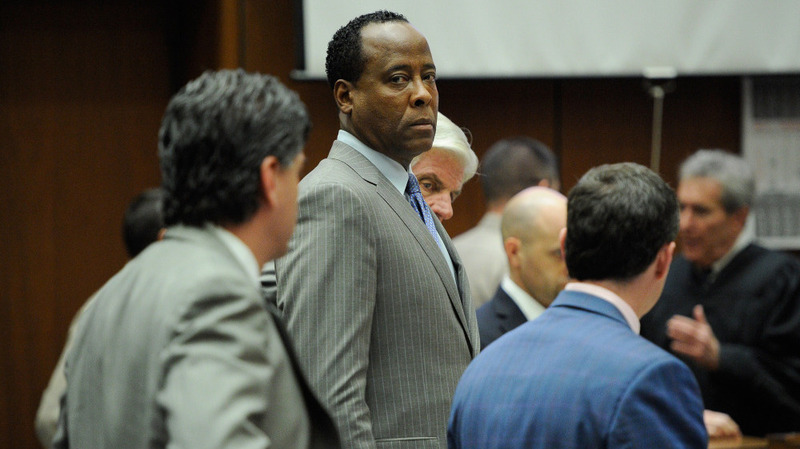 Dr. Conrad Murray, surrounded by his defense attorneys, looks on after the defense rested its case in his involuntary manslaughter trial. Prosecutors and defense attorneys in the involuntary manslaughter trial of Dr. Conrad Murray, the personal physician of the late entertainer Michael Jackson, are preparing closing arguments. They'll deliver these tomorrow now that Dr. Murray's defense team rested its case Tuesday, after six weeks of trial. Murray is accused of negligently giving Jackson a lethal dose of a sedative that killed him on June 25, 2009. As CBS reports, defense attorneys say Jackson was alone when took the medicine known as propofol, accidentally killing himself. If Jackson administered his own fatal dose of propofol, prosecutors contend Murray should have been more reluctant to hand it over, since he knew the singer had taken a large dose of a different sedative, lorazepam, a few hours earlier. They allege the second medication, propofol, increased the chance for medical complications. Murray's defense lawyers called a witness who ended up supporting that point of view. On Monday, a doctor knowledgeable about propofol told prosecutors that Murray violated basic standards of care with Jackson. Defense expert Dr. Paul White said he would never use propofol in a home environment, according to the Daily News. It's generally used to help patients prepare for surgery. And White said he wouldn't have left Jackson alone after taking the sedative, as Murray did. As the defense wound down its case yesterday, there was an moment of heightened tension in the courtroom as Murray told Judge Michael Pastor he would not take the stand to testify. CNN says Jackson fans watching the trial that day were emotional, and one person was ejected from the L.A. County Superior Court after shouting "Murderer" at Murray during a break. Prosecutors will try to persuade jurors to convict Murray in two different ways, according to the Los Angeles Times. One way is to argue that while he acted lawfully when giving Jackson the sedative, Murray was negligent because he should have known the dangers. The other merely alleges he failed to do his legal duty as a physician. If convicted, Murray could face up to four years in prison.